The secrecy capacity of relay channels with orthogonal components is studied in the presence of an additional passive eavesdropper node. The relay and destination receive signals from the source on two orthogonal channels such that the destination also receives transmissions from the relay on its channel. The eavesdropper can overhear either one or both of the orthogonal channels. Inner and outer bounds on the secrecy capacity are developed for both the discrete memoryless and the Gaussian channel models. For the discrete memoryless case, the secrecy capacity is shown to be achieved by a partial decode-and-forward (PDF) scheme when the eavesdropper can overhear only one of the two orthogonal channels. Two new outer bounds are presented for the Gaussian model using recent capacity results for a Gaussian multiantenna point-to-point channel with a multiantenna eavesdropper. The outer bounds are shown to be tight for two subclasses of channels. The first subclass is one in which the source and relay are clustered, and the eavesdropper receives signals only on the channel from the source and the relay to the destination, for which the PDF strategy is optimal. The second is a subclass in which the source does not transmit to the relay, for which a noise-forwarding strategy is optimal. In wireless networks for which nodes can benefit from cooperation and packet-forwarding, there is also a need to preserve the confidentiality of transmitted information from untrusted nodes. Information privacy in wireless networks has traditionally been the domain of the higher layers of the protocol stack via the use of cryptographically secure schemes. In his seminal paper on the three-node wiretap channel, Wyner showed that perfect secrecy of transmitted data from the source node can be achieved when the physical channel to the eavesdropper is noisier than the channel to the intended destination, that is, when the channel is a degraded broadcast channel . This work was later extended by Csiszár and Körner to all broadcast channels with confidential messages, in which the source node sends common information to both the destination and the wiretapper and confidential information only to the destination . Recently, the problem of secure communications has also been studied for a variety of multiterminal networks; see, for example, [3–10], and the references therein. In , Lai and El Gamal show that a relay node can facilitate the transmission of confidential messages from the source to the destination in the presence of a wiretapper, often referred to as an eavesdropper in the wireless setting. Lai and El Gamal develop the rate-equivocation region for this four node relay-eavesdropper channel and introduce a noise forwarding scheme in which the relay, even if it is unable to aid the source in its transmissions, transmits codewords independent of the source to confuse the eavesdropper. A special case where the eavesdropper receives a degraded version of the destination's signal is studied in . In contrast, the relay channel with confidential messages in which the relay node acts as both a helper and eavesdropper is studied in . Note that in all the three papers, the relay is assumed to be full-duplex; that is, it can transmit and receive simultaneously over the entire bandwidth. In this paper, we study the secrecy capacity of a relay channel with orthogonal components in the presence of a passive eavesdropper node. The orthogonality comes from the fact that the relay and destination receive signals from the source on orthogonal channels; furthermore, the destination also receives transmissions from the relay on its (the destination's) channel. The orthogonal model implicitly imposes a half-duplex transmission and reception constraint on the relay. For this channel, in the absence of an eavesdropper, El Gamal and Zahedi showed that a partial decode-and-forward (PDF) strategy, in which the source transmits two messages on the two orthogonal channels and the relay decodes its received signal, achieves the capacity . We study the secrecy capacity of this channel for both the discrete memoryless and Gaussian channel models. As a first step toward this, we develop a PDF strategy for the full-duplex relay eavesdropper channel and extend it to the orthogonal model. Further, since the eavesdropper can receive signals from either orthogonal channel or both, three cases arise in the development of the secrecy capacity. We specialize the outer bounds developed in  for the orthogonal case and show that, for the discrete memoryless channel, PDF achieves the secrecy capacity for the two cases where the eavesdropper receives signals in only one of the two orthogonal channels. For the Gaussian model, we develop two new outer bounds using recent results on the secrecy capacity of the Gaussian multiple-input multiple-output channels in the presence of a multiantenna eavesdropper (MIMOME) in [4–6]. The first outer bound is a genie-aided bound that allows the source and relay to cooperate perfectly resulting in a Gaussian MIMOME channel for which jointly Gaussian inputs maximize the capacity. We show that these bounds are tight for a subclass of channels in which the multiaccess channel from the source and relay to the destination is the bottleneck link, and the eavesdropper is limited to receiving signals on the channel from the source and the relay to the destination. For a complementary subclass of channels in which the source-relay link is unusable due to noise resulting in a deaf relay, we develop a genie-aided bound where the relay and destination act like a two-antenna receiver. We also show that noise forwarding achieves this bound for this subclass of channels. In , He and Yener study the secrecy rate of the channel studied here under the assumption that the relay is colocated with the eavesdropper, and the eavesdropper is completely cognizant of the transmit and receive signals at the relay. The authors found that using the relay does not increase the secrecy capacity, and hence there is no security advantage to using the relay. In this paper, we consider the eavesdropper as a separate entity and show that using the relay increases the secrecy capacity in some cases. 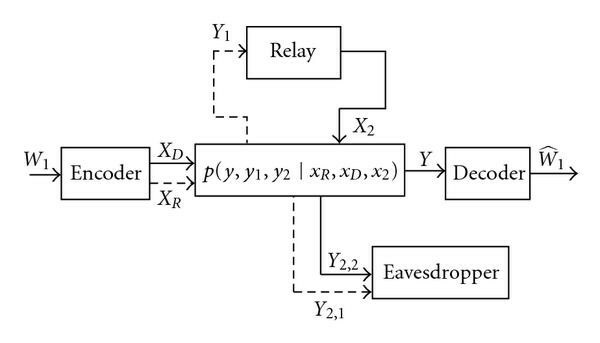 In the model of , the eavesdropper can overhear only on the channel to the relay, while we consider three cases in which the eavesdropper can overhear on either or both the channels. The paper is organized as follows. In Section 2, we present the channel models. In Section 3, we develop the inner and outer bounds on the secrecy capacity of the discrete memoryless model. We illustrate these results with examples in Section 4. In Section 5, we present inner and outer bounds for the Gaussian channel model and illustrate our results with examples. We conclude in Section 6.
a decoding function at the destination . The secrecy capacity is the maximum rate satisfying (2). The model described above considers a relay that transmits and receives simultaneously in the same orthogonal channel. Inner and outer bounds for this model are developed in [11, Theorem 1]. In this paper, we consider a relay eavesdropper channel with orthogonal components in which the relay receives and transmits on two orthogonal channels. The source transmits on both channels, one of which is received at the relay and the other at the destination. The relay transmits along with the source on the channel received at the destination. Thus, the source signal consists of two parts and , transmitted to the relay and the destination, respectively, such that . The eavesdropper can receive transmissions in one or both orthogonal channels such that denotes the received signal at the eavesdropper in orthogonal channel , and . More formally, the relay eavesdropper channel with orthogonal components is defined as follows. Definition 1 assumes that the eavesdropper can receive signals in both channels. In general, the secrecy capacity bounds for this channel depend on the receiver capabilities of the eavesdropper. To this end, we explicitly include the following two definitions for the cases in which the eavesdropper can receive signals in only one of the channels. In the absence of an eavesdropper, that is, for , the channels in (3)–(5) simplify to that of a relay channel with orthogonal components. Thus, depending on the receiver capabilities at the eavesdropper, there are three cases that arise in developing the secrecy capacity bounds. For brevity, we henceforth identify the three cases as Cases 1, 2, and 3, where Cases 1 and 2 correspond to Definitions 2 and 3, respectively, and Case 3 is the general case where the eavesdropper receives signals from both the channels. Throughout the sequel, we assume that the channel gains are fixed and known at all nodes. For a relay channel with orthogonal components, El Gamal and Zahedi of show that a strategy where the source uses each channel to send an independent message and the relay decodes the message transmitted in its channel achieves capacity . Due to the fact that the relay has partial access to the source transmissions, this strategy is sometimes also referred to as partial decode and forward (see ). The achievable scheme involves block Markov superposition encoding while the converse is developed using the max-flow, min-cut bounds. The following proposition summarizes this result. For the Gaussian model, the bounds in (11) are maximized by jointly Gaussian inputs transmitting at the maximum power and subject to (12). While the converse allows for all possible joint distributions of , , and , from the form of the mutual information expressions in (11), it suffices to consider distributions only of the form given by (12). We use the standard notation for entropy and mutual information  and take all logarithms to the base 2 so that our rate units are bits. For ease of exposition, we write to denote and write to denote . We also write random variables with uppercase letters (e.g., ) and their realizations with the corresponding lowercase letters (e.g., ). We drop subscripts on probability distributions if the arguments are lowercase versions of the corresponding random variables. Finally, for brevity, we henceforth refer to the channel studied here as the orthogonal relay eavesdropper channel. In this section, we develop outer and inner bounds for the secrecy capacity of the discrete-memoryless orthogonal relay eavesdropper channel. The proof of the outer bounds follows along the same lines as that in [11, Theorem 1] for the full-duplex relay-eavesdropper channel and is specialized for the orthogonal model considered here. The following theorem summarizes the bounds for the three cases in which the eavesdropper can receive in either one or both orthogonal channels. An outer bound on the secrecy capacity of the relay eavesdropper channel with orthogonal components is given by the following. where , , , and are auxiliary random variables, and the maximum is over all joint distributions satisfying . The proof is extended from the outer bound in [11, Theorem 1] to include auxiliary random variables corresponding to each of the transmitted signals and is developed in Appendix A. Following Proposition 5, a natural question for the relay-eavesdropper channel with orthogonal components is whether the PDF strategy can achieve the secrecy capacity. To this end, we first develop the achievable PDF secrecy rates for the class of full-duplex relay-eavesdropper channels and then specialize the result for the orthogonal model. The following theorem summarizes the inner bounds on the secrecy capacity achieved by PDF for the full-duplex (nonorthogonal) relay-eavesdropper channels. The proof is developed in Appendix B and uses block Markov superposition encoding at the source such that, in each block, the relay decodes a part of the source message while the eavesdropper has access to both source messages. The following theorem specializes Theorem 8 for the orthogonal relay-eavesdropper channel. An inner bound on the secrecy capacity of the orthogonal relay eavesdropper channel, achieved using partial decode and forward over all joint distributions of the form , is given by the following. The proof is developed in Appendix C and involves specializing the bounds in Theorem 8 for the orthogonal model. It is further shown that the input distribution can be generalized to all joint probability distributions . The bounds in (20) can be generalized by randomizing the channel inputs. We now prove that PDF with randomization achieves the secrecy capacity. The secrecy capacity of the relay channel with orthogonal complements is the following. for all joint distributions satisfying . The upper bounds follow from Theorem 7. For the lower bound, we prefix a memoryless channel with inputs and and transition probability (this prefix can potentially increase the achievable secrecy rates as in [2, 11]). The time-sharing random variable ensures that the set of achievable rates is convex. In contrast to the nonsecrecy case, where the orthogonal channel model simplifies the cut-set bounds to match the inner PDF bounds, for the orthogonal relay-eavesdropper model in which the eavesdropper receives in both channels, that is, when the orthogonal receiver restrictions at the relay and intended destination do not apply to the eavesdropper, in general, the outer bound can be strictly larger than the inner PDF bound. In the following section, we illustrate these results with three examples. Since the destination can receive at most 1 bit in every use of the channel, the secrecy capacity of this channel is at most bit per channel use. We now show that this secrecy capacity can be achieved. In each channel use, let the source send bit such that , , and . Since , the receiver obtains while the eavesdropper receives and irrespective of the value of bit . Hence, a perfect secrecy capacity of can be achieved. The code design in Example 12 did not require randomization. We now present an example where randomization is necessary. Thus, the receiver receives both bits while the eavesdropper is unable to decode any information due to the randomness of . This is an example where transmitting a random code from the relay is required to achieve the secrecy capacity. The relay-eavesdropper channel with orthogonal components. In the above two examples, the source to relay link was completely available to the eavesdropper, and hence the relay could at best be just used to send random bits. In the next example, we show that the secrecy capacity is achieved by the relay transmitting a part of the message as well as a random signal. Thus, over uses of the channel the destination receives all bits transmitted by the source. On the other hand, in every use of the channel, the eavesdropper cannot decode either source bit. where is a positive semidefinite matrix, and denotes that is a positive semidefinite matrix. The secrecy capacity of this channel is summarized in the following theorem. We now present an outer bound on the Gaussian orthogonal relay eavesdropper channel using Lemma 15. An outer bound on the secrecy capacity of the Gaussian orthogonal relay eavesdropper channel is given by the following. where the maximum is over all where has diagonal entries that satisfy (8). In (41a) and (41c), the maximizing the outer bound on the secrecy capacity is . On the other hand, can be chosen to be arbitrary for (41b). where (44) follows from the orthogonal model in (3). Finally, applying the conditions on the eavesdropper receiver for the three cases simplifies the bounds in (44) to (41a), (41b), and (41c). The PDF inner bounds developed in Section 3 for the discrete memoryless case can be applied to the Gaussian model with Gaussian inputs at the source and relay. In fact, for all three cases, the inner bounds require taking a minimum of two rates, one achieved jointly by the source and relay at the destination and the other achieved by the source at the relay and destination. Comparing the inner bounds in (19) with the outer bounds in for those channels in which the source and relay are clustered close enough that the bottle-neck link is the combined source-relay link to the destination and the eavesdropper overhears only the channel from the source and the relay to the destination, the secrecy capacity can be achieved. This is summarized in the following theorem. the secrecy capacity for Case 2 is achieved by PDF and is given by the following. where the maximum is over . For a relay channel without secrecy constraints, the cut-set outer bounds are equivalent to two multiple-input multiple-output (MIMO) bounds, one that results from assuming a noiseless source-relay link and the other that results from assuming a noiseless relay-destination link. Under a secrecy constraint, the outer bound in Theorem 17 is based on the assumption of a noiseless source-relay link. The corresponding bound with a noiseless relay-destination link remains unknown. We now consider a subclass of Gaussian orthogonal relay eavesdropper channels for which For this subclass, the source does not send any messages on channel , that is, . Such a subclass is a subset of a larger subclass of channels with very noisy unreliable links from the source to the relay. We present an upper bound on the secrecy capacity for this subclass and show that the noise-forwarding strategy introduced in  achieves this outer bound. Central to our proof is an additional constraint introduced in developing the outer bounds on the eavesdropper that does not decode the relay transmissions. Clearly, limiting the eavesdropper capabilities can only improve the secrecy rates, and thus, an outer bound for this channel with a constrained eavesdropper is also an outer bound for the original channel (with in both cases) with an unconstrained eavesdropper. We show that the outer bound for the constrained channel can be achieved by the strategy of noise-forwarding developed for the unconstrained channel. Outer Bound. Since , it is sufficient to set . This follows from the fact that due to a lack of a communication link between the source and the relay, that is, , the relay is oblivious to the source transmissions. Since the relay and the source do not share common randomness, one can set . Finally, since depends on only via and , is independent of . We now provide two outer bounds for fixed and . Thus, the minimum of the two is also an outer bound. Maximizing over and will then yield the outer bound as in the statement of Theorem 20.
where (48) holds because and are independent, and the Gaussian signaling is optimal, which follows from Theorem 17. Finally, since (51) is an upper bound for the channel with an eavesdropper constrained to ignore , it is also an upper bound for the channel in which the eavesdropper is not constrained. Inner Bound. The lower bound follows from the noise forwarding strategy introduced in [11, Theorem 3]. In this strategy, the relay sends codewords independent of the source message, which helps in confusing the eavesdropper. The noise forwarding strategy transforms the relay-eavesdropper channel into a compound multiple access channel, where the source/relay to the receiver is the first multiple access channel, and the source/relay to the eavesdropper is the second one. where is the path-loss exponent. The maximum achievable PDF secrecy rate is plotted as a function of the relay position along the line connecting the source and the eavesdropper as shown in Figure 3. Furthermore, as a baseline assuming that the relay does not transmit, that is, , the secrecy capacity of the resulting direct link and the wire-tap channel for Cases 2 and 3, respectively, are included in all three plots in Figure 3. The rates are plotted in separate subfigures for the three cases in which the eavesdropper receives signals in only one or both channels. In all cases, the path loss exponent is set to , and the average power constraint on , and is set to unity. In addition to PDF, the secrecy rate achieved by noise forwarding (NF) is also plotted. In Figure 3, for all three cases, the PDF secrecy rates are obtained by choosing the input signal to be Gaussian distributed and numerically optimizing the rates over the covariance matrix (more precisely the three variances of , , and the pairwise correlation among these three variables). We observe that the numerical results match the theoretical capacity result for Case 2 that PDF is optimal when the relay is close to the source. Further, the upper bounds for Cases 2 and 3 are the same as seen also in (41b)-(41c). On the other hand, when the relay is farther away than the eavesdropper and destination are from the source, there are no gains achieved by using the relay relative to the nonrelay wiretap secrecy capacity. Finally, for Cases 2 and 3, NF performs better than PDF when the relay is closer to the destination. We have developed bounds on the secrecy capacity of relay eavesdropper channels with orthogonal components in the presence of an additional passive eavesdropper for both the discrete memoryless and Gaussian channel models. Our results depend on the capability of the eavesdropper to overhear either or both of the two orthogonal channels that the source uses for its transmissions. For the discrete memoryless model, when the eavesdropper is restricted to receiving in only one of the two channels, we have shown that the secrecy capacity is achieved by a partial decode-and-forward strategy. For the Gaussian model, we have developed a new outer bound using recent results on the secrecy capacity of Gaussian MIMOME channels. When the eavesdropper is restricted to overhearing on the channel from the source and the relay to the destination, our bound is tight for a subclass of channels where the source and the relay are clustered such that the combined link from the source and the relay to the destination is the bottleneck. Furthermore, for a subclass where the source-relay link is not used, we have developed a new MIMOME-based outer bound that matches the secrecy rate achieved by the noise forwarding strategy. A natural extension to this model is to study the secrecy capacity of orthogonal relay channels with multiple relays and multiple eavesdroppers (see, e.g., ). Also, the problem of developing an additional outer bound that considers a noiseless relay destination link remains open for the channel studied here. Now, let be a random variable uniformly distributed over and set , , , , , , and . We specialize the bounds in (A.1) separately for each case. This proves the upper bound for Case 1. This proves the upper bound for Case 2. This proves the upper bound for Case 3. For perfect secrecy, setting yields the upper bound on the secrecy capacity. (1)Generate independent and identically distributed (i.i.d.) 's, each with probability . Label them , . (2)For each , generate i.i.d. 's, each with probability . Label these , . (3)For every , generate i.i.d. 's, each with probability . Label these , . Randomly partition the set into cells . Let be the message to be sent in block where the total number of messages is . Further, let where . We can further partition into two parts of rates and , respectively. Assume that are jointly -typical and . Then the codeword will be transmitted in block . At the end of block , we have the following. (1)The receiver estimates by looking at jointly -typical with . For sufficiently large , this decoding step can be done with arbitrarily small probability of error. Let the estimate of be . (2)The receiver calculates a set of such that if are jointly -typical. The receiver then declares that was sent in block if . The probability that with arbitrarily high probability provided that is sufficiently large and . (3)The receiver declares that was sent in block if are jointly -typical. with high probability if and is sufficiently large. (4)The relay upon receiving declares that was received if are jointly -typical. with high probability if and is sufficiently large. Thus, the relay knows that . thus giving , and hence we get perfect secrecy. The equality in (C.16) follows from the fact that is a Markov chain. We further specialize the bounds for the three cases based on the receiving capability of the eavesdropper. The maximization of the expression to the right of the equality in (C.17) over is equivalent to maximizing over the more general distribution , and henceforth, without loss of generality we consider the general probability distribution . Note that maximization of above term over is equivalent to maximizing over general , and henceforth, without loss of generality we consider the general probability distribution . where the last step follows as was shown earlier in (C.18). Note that maximization of above term over is equivalent to maximizing over general . The authors wish to thank Elza Erkip of Polytechnic Institute of NYU and Lifeng Lai and Ruoheng Liu of Princeton University for useful discussions related to this paper. The work of V. Aggarwal and A. R. Calderbank was supported in part by NSF under Grant 0701226, by ONR under Grant N00173-06-1-G006, and by AFOSR under Grant FA9550-05-1-0443. The work of L. Sankar and H. V. Poor was supported in part by the National Science Foundation under Grant CNS-06-25637. The material in this paper was presented in part at the Information Theory and Applications Workshop, San Diego, CA, 2009 and at the IEEE International Symposium on Information Theory, Seoul, Korea, 2009.